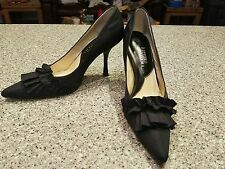 Ladies Stuart Weitzman black open toe& back sandals size 10 AA canvas cross strap,leather padded lining,rubber soles & heels. GOOD = Item shows significant wear along with possible scratches, fading, scuffing. Incredibly fantastic, brand new in box, never worn, Elaine Turner wedges. Too narrow for my wide toe area but they are a true 6.5 in women's length. Pink, hot pink, teal, lime, and light violet diamond/zig zag print on canvas. I purchased at $195 but I never had the pleasure of wearing them because they were too narrow in the toe. I will gladly pay shipping if it's a US address. These shoes are in good condition with just light signs of storage, wear, and handling. They're great with jeans, pants, shorts, skirts, and dresses. It really all just depends on your imagination and unique personal style, event too, of course. These are preowned and in good condition. 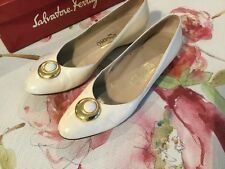 There are gold round buttons with white inserts on the toes. Size/Model: 7.5 2A. International Quote is for CANADA ONLY! Make Supersized Seem Small. We will do our best to make it right. No holes or stains- very good condition. S width- extra narrow. All pictures are taken from the actual item you will receive.